Customers are important to us, without them we would not exist. We will use our best endeavours to keep all of our customers happy, to supply them with the right equipment, at the right price within an agreed timescale. Occasionally things do go wrong. We promise to do our best to ensure that if we do make an error, we will do our utmost to put things right. Normal delivery is by carrier. we endeavour to ship within 24 hours of receiving an order. Delivery will take between 1-3days depending on the method selected and the geographical location. If an unusual situation such as a lack of stock occurs we shall contact you directly. If we have a delay on delivery for any reason, you are entitled to cancel the order without penalty providing that it has not already been dispatched. Whilst we endeavour to meet delivery deadlines, we cannot be held liable for late delivery by our agents therefore delivery times are at the customers risk. Damages and short deliveries should be notified within 3 working days. We charge carriage at cost. The prices on the site checkout are indicative. However should the final cost significantly exceed the estimated charge, we will contact you prior to shipment.You have the right to cancel the order should you consider the charge to be excessive. We accept Visa (all types), Master card Pay Pal and Bank Transfer. Bank transfer will need to be cleared prior to shipment. Credit or Debit card payment is not taken until the day the goods are shipped. All prices are shown as an 'invitation to treat'. All prices are inclusive of UK VAT.This is levied on all goods shipped within the European Community. For countries outside of the EC, the tax is removed by us prior to shipment. Should you need to return the item for any reason, please email or phone for a "returns authorisation". We are happy to refund the cost of any article should it not be satisfactory for any reason. The goods must be in an unused state with undamaged and original packaging and we should be notified with 14 days of your receipt of the goods. The Distance Selling Regulations state a minimum of 7 working days. All returns are at the customers expense. If the return is made after 14 days Premier Marine Paints reserve the right to make a restocking charge up to 15% of the value of the original order. If there is a fault with the good we shall undertake to repair or replace the item at our discretion. The repaired/replaced item will be shipped back to you free of charge. The basis for the guarantee will be that as supplied by the manufacturer. This guarantee is in addition to your statutory rights which remain unaffected. Any contract will be governed by English law. Delivery of an order acknowledgement does not indicate acceptance of an order. 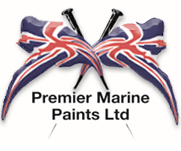 Premier Marine Paints Ltd and the Premier Marine Paints Ltd logo are trademarks of Premier Marine Paints Ltd.